2018-06-04 I love the idea of the trap style antenna. But as I've tried to implement the portable 40/20 meter one, I've had considerable frustration. I'm guessing the main source of my problems is getting the resonant frequency of the traps "just right". My main issue is very high SWR. I get good SWR results on 40 meters, but on 20 it is not acceptable. 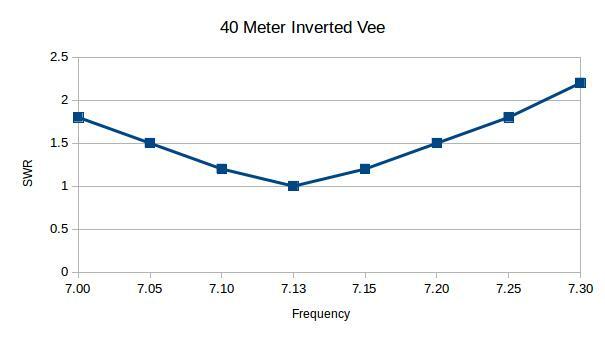 So I decided to go back to basics and start with a simple 40 meter inverted Vee! The apex supported by my Shakespeare TSP20 Six-Piece Wonderpole with the top section removed was 16'6". Each leg, made with #24 RCA Speaker Wire, was 31'3" long. The ends were about four feet above ground. The weight of the antenna itself was 1.8 oz, about as light as a 40 meter antenna could be! The apex was 16'6". Each leg, made with #24 RCA Speaker Wire was 31'3" long. The ends were about four feet above ground. The only test I made with it was measuring the SWR. I didn't attempt any contacts. However, prior to "tossing in the towel" with the trap style, I did make one QRP SSB contact with the Midcars net control, N9AER located about 145 miles away in Peoria, IL on 40 meters. So I'm fairly confident it will work OK.
My thought is to now add a 20 meter element using the same #24 speaker wire resulting in a light weight fan style inverted vee. Having already built one I know it will work. It's main difference from the previous one will be weight, since I'll be using this very small wire.